Take your pick of indoor or outdoor dining at La Casona, the eclectic Mexican steakhouse at Villa La Estancia Riviera Nayarit, which boasts a variety of exquisite flavors and an extensive selection of Prime Cuts, such as Kobe beef and New York Strips. As one of the best fine dining restaurants in Nuevo Vallarta, La Casona is known for its wide variety of eggs benedict and other breakfast favorites in the morning and its scrumptious dinner platters in the evening. 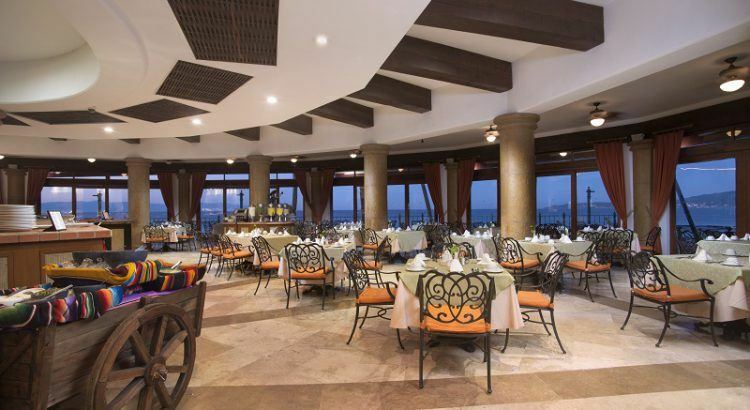 As if the mouthwatering cuisine wasn’t enough, La Casona also lays claim to some of the best seats in the house, which feature the breathtaking scenery of Banderas Bay that stretches beyond our beautiful fountains and resort grounds. La Parrilla Restaurant offers casual poolside dining with a choice of burgers, sandwiches, wraps, Mexican ceviches and seafood specialties. The exquisite flavor combinations, which include traditional and contemporary options, will satisfy your cravings with each delicious bite. Those choosing the La Parrilla for lunch will truly have a feast for the senses any day of the week. While dining poolside, guests can enjoy the gentle ocean breeze, the beautiful gardens, and the sound of birds chirping as they dine in the truly serene ambiance of this Nuevo Vallarta restaurant. An eclectic and colorful restaurant located just north of Nuevo Vallarta right off the main road in the town of Bucerias, Mi Lola is an interesting mix of menu options and funky decor. From its colorful tables and chairs to unique decorations, Mi Lola offers everything from pizzas, fine cuts of meat, and pastas. The staff is courteous and attentive and service is fast. Prices are economical for the large portions and you can be assured of fast service and a well kept, clean restaurant. A good time for the whole family as the many decorations will keep kids entertained and happy during the entire meal. Located on the top floor of the Marival Residences Resort in Nuevo Vallarta, INSU Sky Lounge is a small restaurant with amazing views of the Banderas Bay. Dinner service starts at 6pm and it is recommended to arrive early as there is limited seating. The menu is organized by continent, and all plates are tapas size portions so it is perfect for sharing. Don’t miss the roasted duck spring roll with Hoisin sauce, warm lobster rolls, grilled lamb chop with mint jelly, Napoleon de foie gras on brioche bread, or crab cakes with lemon confit aioli. If you have room for dessert, you will love their dessert tasting tray which includes macaroons, chocolate cream cheesecake lollipops and lime cream tarts. In weekends, they often have live music or a DJ well into the morning hours so you can dance off those calories after your meal. A quaint Mexican style restaurant located in Bucerias, Luna Luna is an excellent choice if you are in the mood for a delicious, hearty breakfast. They offer a variety of healthy fresh squeezed juices and many Mexican speciality breakfast items such as chilaquiles, sopes, and egg dishes. Don’t miss the Banana Sopes with Black Beans! Everything is fresh and made to order, so service is sometimes slow, but the food is so tasty it will be worth the wait. Take a peek into the huge trees in the front yard as you dine, you can often spot large iguanas resting amongst the tree branches. Another Bucerias gem, La Postal is situated on a corner property a block inland from the beach with lots of lovely trees offering a shady escape from the hot Mexican sun. Here you can find everything from wood fired pizzas, to homemade pastas to delicious sandwiches and salads. Don’t miss the giant calzone and try their tasty chimichurri salsa, too. The service is friendly and fast, and the prices are excellent. In the mood for wine? They serve a tasty house red wine in a carafe that equals out to two typical pours. If you have a sweet tooth, make sure to try the gelato at the Buonissimo shop on the corner of the restaurant. The peanut butter chocolate flavor is a favorite with local expats and sells out fast! Located in the 3.14 shopping center near the second main Nuevo Vallarta entrance, La Dolce Vita is an Italian restaurant with its original location on the Malecon in downtown Puerto Vallarta. Gluten free pasta is available for those with allergies, and they have a lovely outdoor patio if the weather is nice. They also offer fresh, homemade pastas as well as chicken, fish and salads so that there is something for every taste. In a mood for authentic Mexican food that is filling and reasonably priced? Definitely don’t miss Alcatraces which has been a local favorite in the area for years. A perfect place for a hearty breakfast or lunch, Alcatraces has an extensive menu with Mexican specialty plates at great prices. They have lots of options for kids as well so it is an ideal spot for the whole family. Next time you are in Riviera Nayarit, why not stop in to try some of these top recommended restaurants. You won’t be disappointed! Real Estate in Mexico: Time to Buy?